I guess one of the most bothering issue that deters most people away is the high hair transplant costs. Let me be honest with you, for most middle income groups, a surgical hair restoration costs a bomb. You got to be ready to spend a substantial sum for a hair implant surgery. If you think you can’t afford it yet, wait till you can, or start saving for it now. Average price for hair transplantation have been easing comfortably over the years. Good news is that in Budapest, Hungary you can get your hair transplant surgery as low as Ł0.70 (€0.8) per hair breadth. 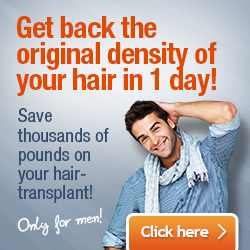 You can save about 60-70% on the UK or Ireland hair replacement cost. 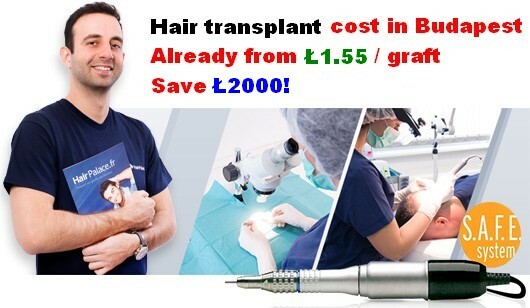 So How Much Will Hair Transplant Cost You? The better a surgeon is does not mean that he or she will charge you more, but you might have to pay a little extra because they are usually very popular and overbooked. Bear in mind that there are some surgeons who charge outrageously over the market price. Even though they might be good, it’s pointless to pay for more than its worth. Be cost-savvy, do some research beforehand and know the average costs plus the hidden costs for the entire procedure. In most part of the country (U.S.) where there are good surgeons, the average costs per graft is around GBP 2 to 5. This price is meant for the top surgeon’s skill and expertise. If you manage to find the right surgeon, make sure he or she is the one doing the transplant for you. There are many hair transplant clinics that have branches operated by other less experienced surgeons. Insist on the surgeon based on their reputation and portfolio. Usually your surgeon will charge you based on the amount of grafting you will need but some clinics might offer you a fixed charge for each session. Each session will usually costs around GBP 1,000 to $7,000. The clinics that charge by session can adapt the patient’s needs and his budget by adjusting the number and length of the hair transplant sessions. I recommend that you choose based on the amount of grafts if possible because you can actually determine how many grafts you will need and estimate the costs more accurately. 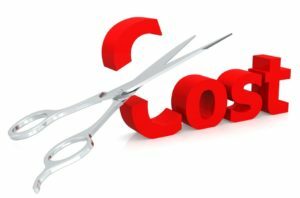 So, the basic cost really depends on the amount of grafts you will need. The more hair you have lost, the more you will have to pay. So I suggest, don’t start too late! Set aside some allowances for maintenance care. Although your new hair is DHT resistant, other factors like poor diet and stress can agitate hair loss. So it’s best to keep your investment in good care. In most cases, your doctor will ask you to return for a checkup after a few weeks and if you are staying somewhere far, then that is another additional cost to you. Speak to your doctor about it if you do not want to stay too long for a revisit. If you really need to get it done without worrying about paying a huge sum of cash up front, you can always ask the clinic whether they provide financing options. Most good clinic nowadays understands the high cost customers are facing and they offer financing plans. Also, make sure you do your research on the various clinics before choosing one that fits the bill. If you intend to travel quite far for hair transplant, then look for special clinics that offer travel packages and rebates. Some of them provide air flights plus accommodations at very attractive rates. Hair replacement might sound pretty expensive to you. But if you can afford it, it’s a very good choice for you since it’s a long lasting investment. Comparatively speaking, if you were to take Propecia, Rogaine and other hair loss products every month to maintain your hair, you will need to spend around GBP 800 per year. As you have to take it for as long as you need, on average you will have to spend around GBP 15,000 for 20 years. Further to that, there is not guarantee that these products can help you maintain your hair. A good hair implant surgery costs much less in the long run. Furthermore, you won’t need to worry about the possible side effects or forgetting to take your medications. It’s a good way to keep your dependency off your medications. Read our useful review of cost cutting Turkish hair clinics, too! It’s good to seek a few hair clinics and request a free consultation. Most clinics provide free analysis of your condition and can properly estimate the overall transplant cost. Ask your doctor the details of the costs including all the potential hidden costs such as maintenance to get a clearer picture. Double checking is always important to make sure you are not overpaying and keep you within your budget. Now our hair specialists provide free consultation service in Dublin, Belfast, Glasgow, Edinburgh, Birmingham, Manchester, Leeds and London. All you need to do is pick a destination nearest your home and get a fair assessment of your hair status and a favourable treatment plan to get a new hairline in Budapest. Price for treatment varies but you can count €0.79 per hair (€1.73 / graft) on average.